When the draw results for elk and antelope came out this spring, for me there was good news and there was bad news. Bad news: Once again I failed to draw an antelope tag. I am now up to 19 bonus points for antelope! I’ve never been drawn, although I apply every year. Good news: I did get drawn for a rifle bull elk tag! This is only the second time that I’ve been drawn for bull elk. My son Ben was on the application with me, so we will be hunting bull together. Bad news: The hunt is at the end of November into the first couple of days of December. I have been drawn for the late season elk hunts before, for cow. Being a tent camper, I know how cold those nights can get. I remember vividly a cow hunt in the White Mountains at that time of year. I survived the first couple of nights when the temperature dropped to around 17° overnight. But on the third afternoon, a big snowstorm came in. I decided that I had enough, so I packed up camp and got outta there! The memory of white-knuckle driving over a 9300 foot pass at night in a white-out will never leave me. So immediately I started thinking about upgrading my hunting shelter. I started looking into a real canvas Montana-style tent and a wood burning stove. That thought cooled rather quickly when I started thinking about how much work would be involved in pitching one of those tents. I would have help on this elk hunt, but on other hunts in the future, I likely wouldn’t. Motor home: The main advantage would be that I could still tow a trailer to haul my Polaris Ranger hunting buggy. Disadvantages: If you need to make a run into town, you basically have to take your camp with you. Then when you get to town, a motor home can be a beast to park, depending on the size. Speaking of size, most motor homes are tall. Getting back into the game-rich, remote spots in the woods frequently involves tight trails and low hanging tree branches. If your idea of RVing involves developed campgrounds, electrical and water hookups, and lots of nearby neighbors, then no problem. But you don’t hunt out of an RV park. 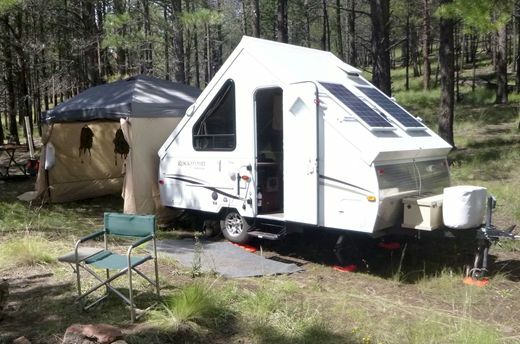 Yes, a Class B motor home, which is basically a large outfitted van, can be more manageable in the woods and in town. But living space is pretty cramped in a Class B. Then there is the factor of having another vehicle drivetrain to maintain, on a vehicle which will sit a lot, and be driven little. Expensive to buy, expensive to maintain. My homeowner’s association (even if I could) would not allow me to park a motorhome on my property. I would have to store it at an RV parking yard. Even more expense. Scratch the idea of a motor home. Fifth Wheel Trailer: They have lots of room, no extra engine to maintain, and they can be disconnected from your tow vehicle, allowing you the flexibility of leaving camp behind when you need to use your truck. I’m not sure of the laws in Arizona whether you can hitch another trailer behind a fifth wheel. Even if you could, I wouldn’t want to drive a train like that anywhere, let alone rough and skinny forest trails. Fifth wheels are often even taller than motor homes. You would still have the problems of overhanging trees and the need for storage away from home. For me, I would have to sell the Chevy Avalanche and buy a real truck. You can’t hook up a fifth wheel to a Chevy Avalanche. Scratch the fifth wheel. Toy Hauler Trailer: No doubt that toy haulers have lots of living space. But a toy hauler shares the disadvantages of tallness and the need to be stored, as already mentioned for motor homes and fifth wheels. I really like the Avalanche as a daily driver. I used to have a large crew cab truck, which I traded in for the Avalanche. The Avy is definitely a nicer daily ride than the old truck. But the Avalanche is only a sort-of truck. I gave up a lot of cargo carrying and towing capacity when I downsized to the Avy. A toy hauler large enough to take the Polaris Ranger, which needs a free space of 6 feet of width and 10 feet of length, would be a rather large trailer. A trailer that big would not be a comfortable towing experience behind the Avalanche. Scratch the toy hauler. A basic Travel Trailer: Ok, so what if I just abandoned the idea of taking the Polaris with me on hunting trips? Or, what if Ben pulled the Polaris behind his Toyota Tacoma, while I pulled the backwoods housing? We are starting to approach a solution. My Avalanche is a Z71 4x4 off-road model. It’s at least competent as a back road vehicle with a bed big enough to haul Arizona’s largest game. It can’t get it into the tight and gnarly places that the Ranger can go, but it can at least get meat-packing close enough, most of the time. There are many models of lightweight travel trailers on the market that the Avalanche could quite comfortably tow. The trailer could be unhitched at camp, leaving the Avalanche free for exploring the hunting area and for making runs into town for provisions. The only disadvantages remaining are the height issue, which could be less than for the other types of RVs already mentioned, and the need for offsite storage. Popup Trailers: A popup trailer solves every problem except getting the Ranger to the hunt area. As already mentioned, Ben could help with that by pulling the Ranger separately with his truck. A popup will not only fit in the garage for storage, but it’s lower profile helps gas mileage as well. Fitting into the garage was a major factor for me. For a long time I had to store the Ranger trailer away from home. For a while, Bill Whitecotton let me store it in his backyard, but that eventually ended and then I had to store it at a commercial lot. It was always such a hassle to have to plan ahead to go get the trailer when I wanted to use it. If I couldn’t store the RV in the garage, I would probably have stuck with the idea of a canvas tent with a wood stove. Like most folks, when I thought of popup trailers, I thought of tent trailers. A tent trailer would not really have solved the main problem of having a warm place to sleep on a late season elk hunt. 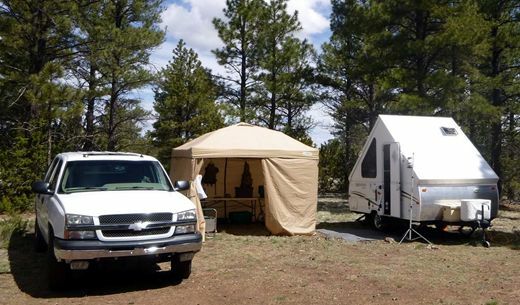 Tent trailers get hot in the summer, but lose heat quickly in cold temperatures. Tent fabric is not a good insulator. So when I discovered the popup trailer you see in these photos, I knew that I had found the perfect solution for me. This trailer is a Forest River Rockwood model A128. It is what is called an A-Frame trailer. It is a popup, but it’s totally hard-sided. This type of trailer was first brought to market by a company named A-Liner. They are probably the best known maker of A-Frame campers. A-Liner is somewhat of a “boutique” trailer maker, in that they are a small company with low volume. Hence, their trailer prices tend to be on the high side for what you get. In 2011, Forest River, which may be the largest maker of RVs in the nation, started making their own A-Frame trailers. To give you an idea of how large of an RV maker they are, you know how General Motors has several makes of what is essentially the same vehicle? Think GMC and Chevy pickup trucks. Think Chevy Suburban and Cadillac Escalade. Well Forest River has four brands that all make A-Frames. These brands are Rockwood, Flagstaff, Coachman Clipper, and Coachman Viking. There are some differences among them, as you might expect, but overall they are very similar. Compared to tent trailers, A-Frames have much less room. The inside dimensions of the trailer box of the A128 are about 12 feet long and 7 feet wide. The overall outside length of the trailer from the spare tire on the back to the trailer hitch is 17 feet. It is just short enough to fit in my garage. Mine is a 2012 year model. There are other A-Frame models which are bigger. There are the “high wall” versions, where the folding hinge for the side walls is about 6 inches higher. This allows taller cabinets inside and a more capacious refrigerator. I think that all of the high wall models also have some sort of storage forward of the main box which makes them longer as well. The most common additional storage is a front storage box. These models will be denoted by the letter “S” at the end of the model number. For example, a plain old model A128 like mine is no longer available. A model A128S is however. But with the front storage trunk, that baby is too long to fit in my garage. Other storage options are the Bike Hauler (BH suffix – meant for bicycles) which is a short grated section out front in place of the storage box. And finally there is the Toy Hauler (TH) model which has a grate section out front large enough to carry a quad ATV. Plus the side fences come off to act as loading ramps for the quad. The main standing area of the trailer is the middle, where you have great headroom. But you do have to be careful about bumping your head as you move toward the ends. But that’s where the seating or bed area is, so you are not going to be standing there anyway. One of the A-Frame’s greatest features is how quickly it goes from flattened travel mode to erected camping mode. It takes about a minute to lift the roof into the A-frame shape, step inside and first lift the passenger’s side triangular wall, lock it into place, then do the same with the driver’s side wall. Yup, that fast. Of course really making camp takes a bit more time than that, including leveling, lowering the stability jacks, disconnecting from the tow vehicle, arranging the inside for livability, etc. But in the case that you arrive at a camp site in the pouring rain, you can be enclosed with a solid roof over your head in about a minute. Speaking of solid, the roof and walls are made of a heat and vacuum bonded material called Lamilux. It is two flat sheets of fiberglass sandwiching about an inch of styrofoam. I think that you can see how this would offer much better insulation than tent fabric. For such a small RV, it has a lot of creature comforts. It has a heat pump air conditioner, a propane furnace, a 12V ventilation fan, a 3-way refrigerator (AC, DC, and propane), a sink with 12V water pump, a 3-burner propane stove, a hot water heater, and a microwave oven. You can only use the air conditioner and the microwave when you are hooked up to 30 amp AC service though, such as at a campground with full hookups. There is no toilet, so there is no “black” tank. Though it has a sink, there is no grey tank either. The sink water drains out of a connector on the side of the trailer. If you are in a developed campground, you attach a hose to that port and run it into an Aquatainer or some other water container sitting on the ground next to the trailer. When it gets full, you take the container to the campground bathroom and dump it in the toilet. There are wheeled containers made just for this purpose. It has a 20 gallon fresh water tank, plus a 6 gallon hot water heater. I leave the water heater empty and bypassed. I only use the 20 gallon fresh water tank. For me, that’s a huge upgrade from the 7 gallon Aquatainer I have been taking with me tent camping all these years. 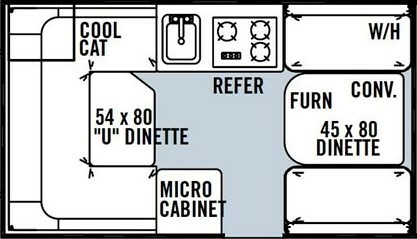 As an aside, there are a number of different floor plans available in different models, including some that have a cassette toilet. A cassette toilet has a small (5 gallons or so) black tank. To dump it, you open a hatch on the side of the trailer and pull out the tank, the “cassette,” which you take to your campground toilet to dump, or to your own when you get home. My model has two dinettes at each end of the trailer that convert into beds. The rear bed is full size, while the front bed is a bit narrower. A family of four with two young children would be tight & cozy on a long weekend campout. 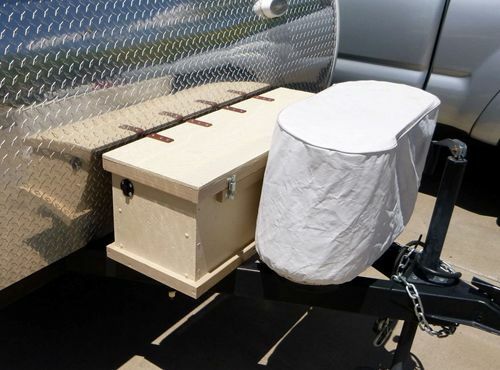 Two good hunting partners, one in each bed, are quite comfortable, though an EZ-Up canopy for equipment overflow is needed to make that tolerable for the long haul. I once visited the camp of a friend during his archery elk hunt. His camper was a large, but basic toy hauler. Since a toy hauler is a mobile garage, they can be a little spartan inside. My son Sam and I visited and hung out for a while, sitting on a couch watching TV. Something about that experience just felt off. I guess it was the feeling of sitting in a big box, disconnected from the outdoors that we had come here to enjoy. For many years, that soured me on any serious thought of getting an RV. As a tent camper, I was used to, and enjoyed being more immersed in the great outdoor experience. The small size of the A-Frame trailer invites you to spend most of your time outside of it. I still feel like I’m camping in the outdoors with this trailer. In many ways it seems more like a hard-sided tent, though one with a few more creature comforts. I still set up my accordion frame canopy next to the trailer with camping tables and chairs. Depending on the weather, I may or may not put up either the solid or the screen side walls for the canopy. Most camp cooking still happens under the canopy, not in the trailer. The A-Frame just fits my camping style. I just concluded an eleven night campout for my 2015 deer hunt. What’s notable compared to last year – same place, but tent camping last year – was that I did not have to break up my hunt to head into town for a resupply mission. Last year, I had to go restock on ice on the fourth day out, and I also had to refill my water jug. This year when my ice melted, I moved everything in the cooler into the RV refrigerator running on propane. The trailer is equipped from the factory with two 20 pound propane canisters which easily powered the frig for the entire time. On day 8, it rained all day long. I took the day off from hunting. What a luxury it was to spend the day in the trailer, warm and dry. I slept in, worked on this newsletter, and did some reading. I would have survived in the tent, but there’s a difference between surviving and thriving. The very first weekend after the trailer came home, the modifications began. I saved a hundred bucks by telling the RV dealer that they could keep the new battery that they normally would have sent me home with. With the help of my brother-in-law, we built a custom battery box to house a very large battery that I already had on-hand. During my solar power experimentation earlier this year, I found a source for some outstanding AGM solar batteries. These batteries are about 21” long by 9” wide by 10” tall. They weigh about 130 pounds each and have a capacity of around 200 amp-hours. Normally, one of these batteries would have cost around $500. I purchased several at $100 each. I put the best one in the trailer. Somebody had bought them for an off-grid solar power project, but for whatever reason, they didn’t complete the project. So these batteries had been sitting around new and unused for over two years. That’s not good. 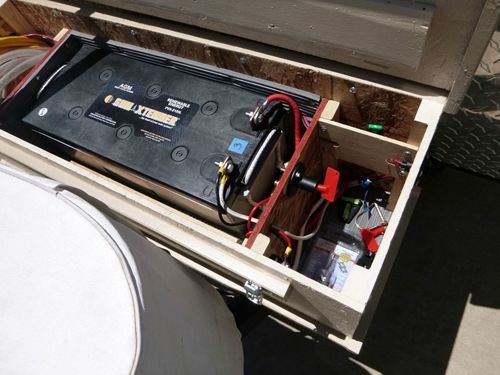 Without regular charging, lead-acid batteries will self-discharge and sulfate. The battery dealer got them for their scrap value. Fortunately, these top quality batteries are not that easy to kill. After some recondition charging and testing, I estimate that they still have a minimum of 80% of their original capacity. Since I got them for only 20% of their new cost, I feel that I got an awesome deal. Not all at once, but over the course of the summer, I further upgraded the trailer’s electrical system. I added a solar charge controller, installed 200 watts of solar panels and a 300 watt DC to AC pure sine wave inverter. Remember my solar power pack story earlier this year? 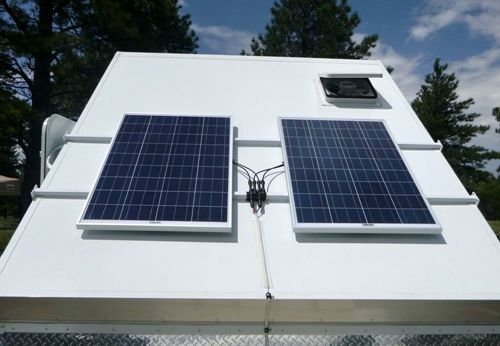 Well this trailer is my latest and greatest solar power pack. I also added an external 12 volt cigarette lighter power socket. The external socket allows me to power 12 volt LED lights in the canopy. I built a cord out of low voltage landscape lighting cable that runs from the side of the trailer to the canopy. The socket is switched from inside the trailer so that I have control of the outside lights from the inside. Now, completely unplugged from the grid, I have an indefinite abundance of electrical power, both AC and DC, for my camping needs. Only the air conditioner and the microwave take more power than my solar system can supply. Those are non-essential systems though. Another mod was to add foam anti-fatigue mat over the whole floor. Early in the camping season I learned that the linoleum floor can be a bit chilly to the feet in socks on cool nights. At Lowes I picked up 12 feet of this mat. It comes on a roll and the salesman cuts off as much as you want. The mat is 3 feet wide. The center aisle floor of the trailer is just a shade narrower than that. The mat is like memory foam, in that it will take an impression of any weight that sits on it, then it slowly pops back when the weight is removed. I guess that means that it has a lot of small air pockets, which should make it a good insulator. As you might imagine, I’m pretty jazzed about this little off-grid cabin that can go almost anywhere. Ground clearance isn’t that bad, but approach and departure angles have to be watched on rough roads. Yes, now I have to stick to smoother dirt roads. That seems a fair tradeoff as long as I can get deeper in, either with the Avalanche by itself, or with the Ranger trailered in separately. With a lot of my camping gear now stored in the trailer, getting out in the wild is easier and more comfortable than ever.